I was 10 years old when I first tasted a quesadilla, cheese melted inside crisp wheat flour tortillas. It’s a cliché to say so, but it was love at first bite. In the more southern regions of Mexican cuisines they use corn tortillas, but here in the Texas Mexican region we most often use wheat flour. Of course we also use corn. A quesadilla is all about simplicity and basics. But you can’t microwave them, nor can you just fold them and heat willy-nilly. It’s not soft, it’s not a taco. 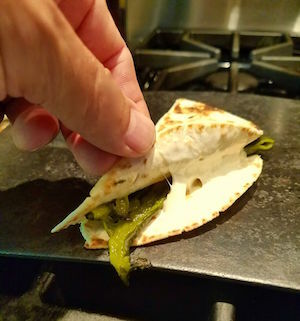 Roasted Chile Poblano Quesadilla requires medium heat on a comal to turn the exterior crispy. The quesadilla is crispy on the outside without being hard, and it’s moist on the inside, the melted cheese providing a contrast. You need really good melting cheese and good tortillas. Aside from the flavors, you’ve got to pay attention to the mouthfeel: it’s crispy then creamy then soft then crispy-crunchy. I could eat a whole dozen. 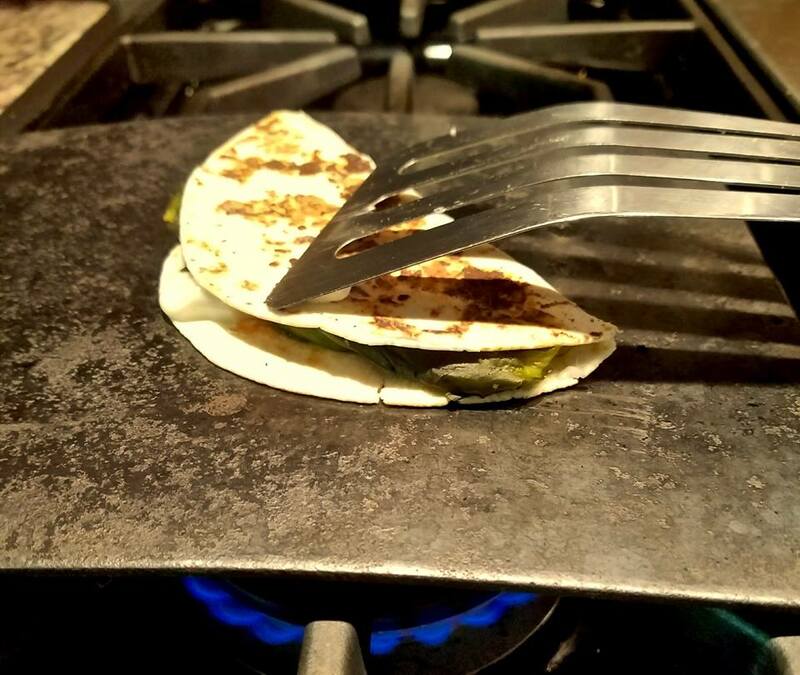 First of all, I ask patience from my Chicana and Chicano quesadilla makers who already know how to do this so effortlessly. We do it at home all the time. I like to give specific instructions so that anyone can make great quesadilas and enjoy with friends. 2. Place tortillas on the hot comal and let them roast slightly, until they become golden and crispy, about 30-45seconds. Remove from the comal and place on a plate, roasted side up. Spread 1 Tbs shredded cheese on one half. Fold it shut. 3. Return it to the comal and cook one side for about 15 seconds, then turn it over and cook the other side for 15 seconds. Keep doing this until the exterior is very crispy and golden but not burned. The cheese will melt. It’s brilliantly simple. Serve hot.